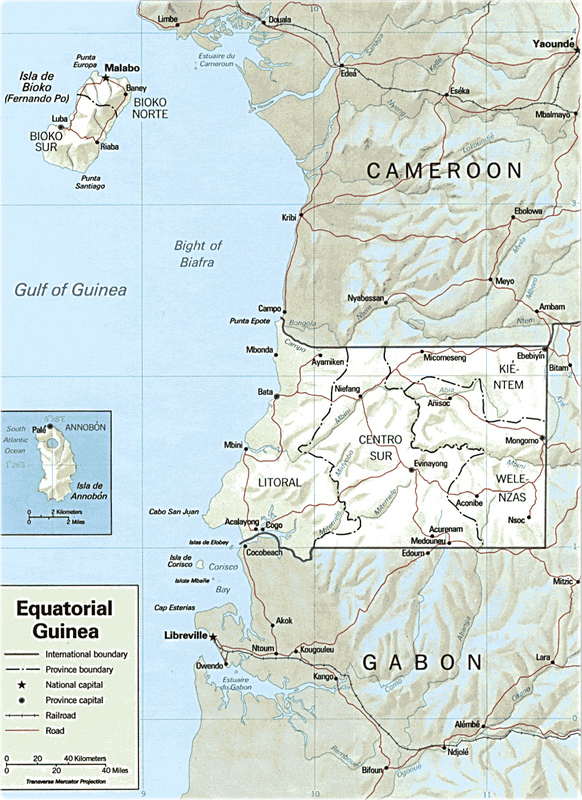 Equatorial Guinea is an independent country in western Africa, consisting of a mainland section called Mbini on the western coast and the coastal islets of Corisco, Elobey Grande and Elobey Chico as well as the islands of Bioko and Annobón in the Gulf of Guinea. Mainland Equatorial Guinea is bounded on the north by Cameroon, on the east and south by Gabon, and on the west by the Gulf of Guinea. The terrain is gently rolling and heavily forested; about 60 % of the area is drained by the Mbini River. Shaded Relief - CIA 1992. Copyright © Geographic Guide - Travel and Tourist Guide and Maps.